Be it soups or desserts, beetroot can secure a place in almost every recipe. You can have this versatile vegetable in the form of an appetizer or introduce it into the main course itself. It has a varied number of health benefits too. 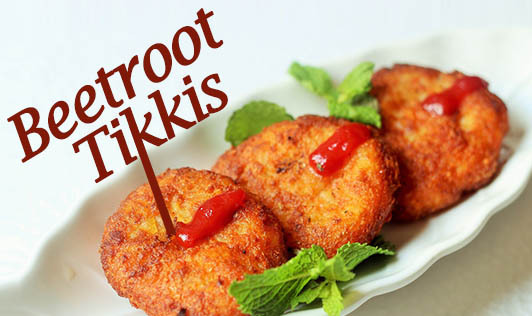 So here is one more interesting tikki recipe to add to your large recipe book. • Wash and peel the beetroots and carrots, and cook in enough water for 10 minutes. • Cool the veggies, grate them, and keep aside. • Heat 1 tbsp oil and 1 tbsp butter in a nonstick pan, toss in the jeera, green chilies, ginger paste, black pepper, and stir well. Now add the grated beetroots and carrots, and cook for 5minutes. • Add the potatoes and salt, and cook until all the moisture disappears. • Add all the remaining ingredients except for the corn flour, wheat flour, and bread crumbs. • Mix well and divide the mixture into 16 equal portions. Make tikkis out of the mixture. • Mix wheat and corn flour in a bowl, add 1 cup water and mix again to make a thick batter. • Dip the patties in the batter; roll them in bread crumbs and then shallow fry on medium flame until golden brown on both sides.